SAN FRANCISCO—At its public meeting on August 21-22, the Judicial Council approved a recommendation from its Technology Committee on a governance and strategic plan for court technology. The plan provides a structure and roadmap for technology initiatives and will increase the transparency and accountability of how funds are managed for technology projects in the judicial branch. 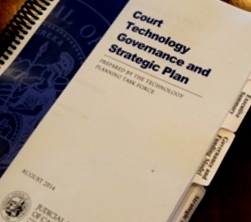 The Judicial Council directed creation of the technology plan in August 2012. Creating the technology plan also involved input from the Legislature and the executive branch, as well as posting it online for public comment. Expanding Legal Representation: In accordance with the Sargent Shriver Civil Counsel Act, the council approved a recommendation to award $7,738,000 in grants to qualified legal service organizations and court partners for pilot projects to provide legal representation and improved court procedures for eligible low-income litigants in civil cases affecting basic human needs. Those pilot projects are in Kern, Los Angeles, San Diego, San Francisco, Santa Barbara, and Yolo Counties. Draft Language Access Plan for Courts: The council reviewed a draft statewide language access plan for limited English proficient court users that sets specific goals for a consistent statewide approach to language access in the California courts. The draft plan makes recommendations for the provision of language access services at all stages of a court user’s interaction with the court system, including courtroom proceedings, mediation, clerks’ offices, and self-help centers. The working group’s draft plan is currently posted for public comment until September 29. Following the public comment process, the working group will revise the draft plan and formally present it to the Judicial Council for its review and adoption. Report on K-12 Civic Learning Recommendations: The council received an informational report from its Power of Democracy steering committee, established by the Chief Justice to guide and support the Chief Justice’s civic learning initiatives. The committee shared the final report of the California Task Force on K–12 Civic Learning, established by the Chief Justice and State Superintendent of Public Instruction to develop recommendations for elevating the status of civic learning in our public schools. The steering committee is overseeing implementation of the task force’s recommendations, which include actions that can be taken by educators, business, elected officials, courts, community organizations, families, and students. Fiscal Year 2015–2016 Budget Planning: The council approved budget requests related to the Supreme Court and Courts of Appeal, as well as funding for the Judicial Council, which includes the Judicial Branch Facilities Program. These budget requests will now be developed into full budget change proposals and submitted to the State Department of Finance, the standard process for proposing funding adjustments. Funding for Document Management System: The council approved a recommendation from its Technology Committee to submit a budget change proposal to the state Department of Finance for a document management system for the Supreme Court and Courts of Appeal. The system would improve efficiency, reduce costs associated with record storage and retrieval, and improve customer service to the bar and public. Department of Finance Outlook on the State Budget: The council received an informational report on the state budget from Michael Cohen, the director of the California Department of Finance. He also took questions from council members, including an inquiry about why this year’s budget didn’t provide the judicial branch with the $266 million needed to maintain current—but unsatisfactory—levels of service to the public. While acknowledging the past several years of budget reductions for the judicial branch, Cohen confirmed the administration’s commitment this year to the current FY 2014-2015 state budget, which includes an increase in state General Fund support for the judicial branch and an additional 5% increase for funding for trial courts in FY 2015-2016. He forecast a continued modest expansion of the state’s economy, but reported the state needs to be conservative in its budgeting and strengthen its rainy day fund, relaying that all areas of state government will continue to compete for a limited pot of funding. Council Oversight of Judicial Council Contracts: The Advisory Committee on Financial Accountability and Efficiency for the Judicial Branch performed a review of contracts entered into by Judicial Council staff on behalf of the council. The committee reviewed ten consulting contracts and noted that the contracts generally met the established criteria to ensure that they are in support of judicial branch policy, were for financial and efficient purposes, and benefitted the judicial branch. The council received the committee’s report and referred it to the council’s Executive and Planning Committee. 2014 Recipients of Distinguished Service Awards and Access to Justice Award: At a special awards presentation, the council honored the recipients of this year’s Distinguished Service Awards, which recognize individuals who exemplify the leadership strengths that create significant and positive contributions to court administration in California. The council also presented the Aranda Access to Justice Award, which honors a judicial officer who has significantly improved access for low- and moderate-income Californians. An archived audiocast of the entire meeting broken out by topic will be available on the August 21-22 council meeting webpage early next week.